Microsoft Live in nidang in a bawl ahi Office Live pan in a piak "Office Live Small Business" program pen a beisa zang nanwlo uh a, program a hoih zaw leh laigelhna a ding van tampi aki ngah zaw tam ahi Office365 tawh hong update ta uh a, a beisa hun a, piak uh peng ki zang thei nawnlo hi. discontinued. Microsoft®Office 365 is the next generation of productivity services for small businesses. Learn more at www.office365.com. If you had a domain (also known as a customised web address) hosted on Office Live, your website has been redirected to a no longer available page. 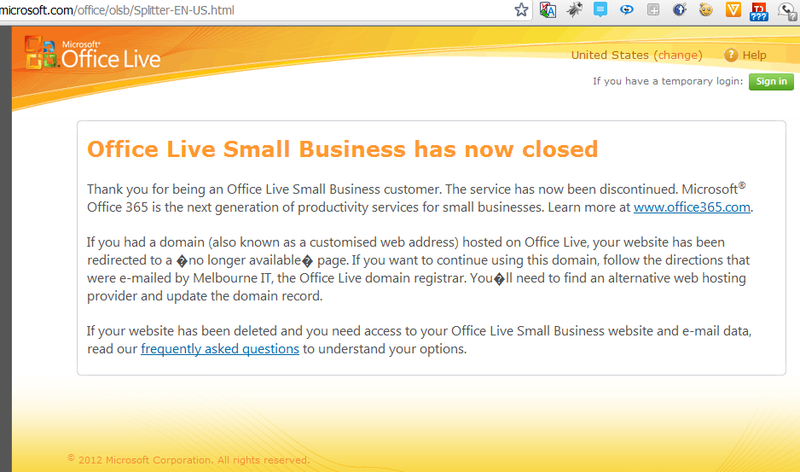 If you want to continue using this domain, follow the directions that were e-mailed by Melbourne IT, the Office Live domain registrar. You'll need to find an alternative web hosting provider and update the domain record. If your website has been deleted and you need access to your Office Live Small Business website and e-mail data, read our frequently asked questions to understand your options. A nuai a mun pan in a thak in laih tota uh a Office 365 cih mintawh zangto ta uh hi.